TSP Legal > News > General News > Love is in the air – Valentine’s Day proposals – should we sign a pre-nup? According to the American writer, Richard Bach, true love stories never have endings. Whilst this is certainly the case for many couples, there are unfortunately an inevitable number of couples for whom this is untrue and who are faced with the consequences of having to deal with a relationship breakdown. If the couple are married or in a civil partnership and a pre-nuptial agreement (also known as a pre-nup) has been put in place, this may help to assist the couple in sorting out their financial and property issues when their relationship comes to an end. With many couples celebrating Valentine’s Day wedding proposals, newly engaged couples should consider the benefits of signing a pre-nup to deal with what is to happen to their financial and other affairs in the event of their relationship coming to an end. We often hear about pre-nups in the context of divorcing celebrities, particularly in America and whilst the idea of signing a pre-nup might not be as romantic as the wedding proposal, for many couples planning their marriage, such agreements are becoming increasingly common. With 42% of marriages expected to end in divorce and with around half of these divorces to be expected to occur in the first 10 years of marriage, pre-nups are regarded as a practical way of agreeing how the financial and property affairs will be dealt with if a couple’s relationship sadly breaks down. A pre-nup is signed by a couple in anticipation of their marriage or civil partnership and not less than 28 days before their wedding ceremony. It can deal with assets that the couple have accrued prior to their relationship which they may wish to safeguard, including inherited assets. The pre-nup can also deal with assets accumulated during the relationship, such as the family home or jointly owned property or bank accounts for example. It can also deal with any financial provision the parties may wish to make for their existing children. Is a pre-nup binding and enforceable? Both parties must take independent legal advice. 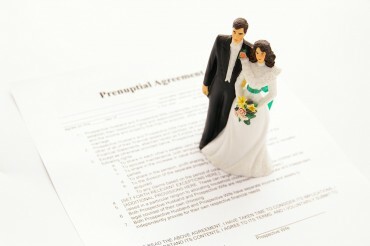 What if circumstances change after a pre-nup is signed? Pre-nups should not be considered as once and for all documents. As a couple’s relationship progresses and circumstances change, the parties should review their pre-nup and make changes where appropriate. This can be dealt with by preparing a post-nuptial agreement (post-nup) which may be necessary if, for example, the couple have children or there is a significant change in financial circumstances such as ill health, bankruptcy or inheritance for example. I’m not a celebrity – do I need a pre-nup? Pre-nups are no longer just for the rich and famous, and can be particularly useful in short or childless marriages, or where one party is significantly richer than the other. They are also common for couples who have previously been divorced and who are embarking on a second or subsequent marriage. In practice, they should be considered by all couples planning marriage as, whilst of course putting an agreement into place will cost some money, it can save a lot of time, heartache and considerably more money in the future. If you would like to make an appointment or have any questions arising from the matters raised in this article, or any other family law matter, please contact Shelley Cumbers on 01206 57441 or email shelley.cumbers@tsplegal.com. Shelley advises clients on all aspects of private family law and is able to offer a free initial chat for prospective clients. She is a member of Resolution and a Collaborative Lawyer. She is committed to resolving matters constructively and sensibly.